I’ve been looking for more on Edwin Ruthven Clapp (1827 – 1906), my 3rd Great Grandfather. 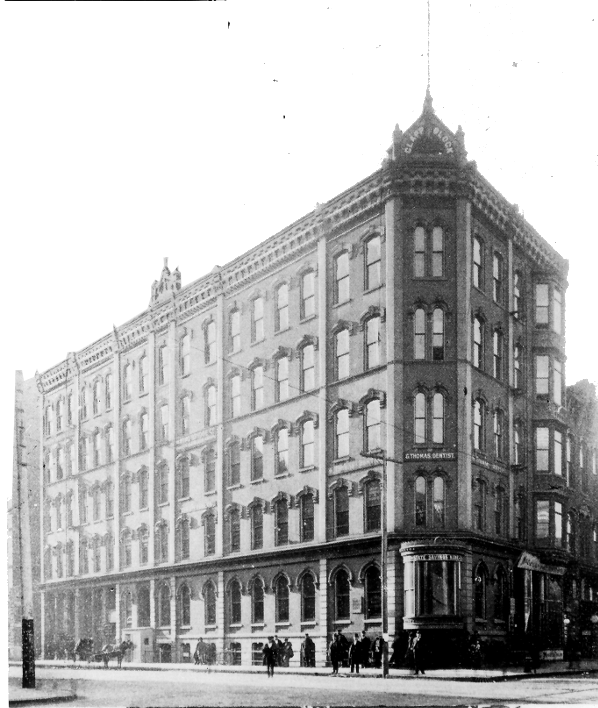 He built a large and famous office building in Des Moines, called “The Clapp Block”. On August 7, 1901 there was a full page on The Clapp Block in the Des Moines Daily News. It seems to be an “Editorial” page, probably intended to flatter the tenants of The Clapp Block and encourage them to advertise. So it’s sort of a vanity page. Of most interest to me is the block in the upper right, starting with “The Clapp Block’s history . . .” I’ve transcribed it below. While the style is a bit flowery and over flattering, this account was certainly constructed after an interview with Edwin Ruthven and we get a few details about his migration to Fort Des Moines that I did not have before. The Clapp Block’s history is interwoven with the history of it’s owner, Mr. E.R. Clapp, whos history is linked with that of Iowa. Mr. Clapp had the good fortune to be born in Ohio, and in March 1846, he, a rugged youth of about sixteen summers, reached Fort Des Moines. He had come through Burlington, the capital of the commonwealth, and at Mt. Pleasant he arranged with John Molt, who sometimes hauled groceries from the capital town on the Mississippi to Fort Des Moines, the capital, that was to be, to bring him here. Teamsters in those days when contracting to transport young men, made it part of the consideration that the young men should “walk up the hills”. On the way from Oskaloosa Mr. Clapp stopped at the only three hostelries between that point and Fort Des Moines — Sam Peet, Black Oak Grove; Adain Toole’s, Tool’s Point; Thomas Mitchell, at the place where the town of Mitchellville now stands. There was no house of any description between Oskaloosa and Fort Des Moines save these three. Corporal Hill, with his corporal’s guard — ten soldiers — occupied the Fort and there were evidences that an earnest culture of the arts of peace would soon be inaugurated. April 6 of the same year Fort Des Moines was selected as the county seat of Polk county, although civilization had advanced far enough to admit of a genuine county seat contest, “Saylor Bottom” being a zealous suitor for the judicial center. Of course, the present siters won the contest. Mr. Clapp soon adjusted himself to the situation, little dreaming that where the thick hazel brush grew, the site of his handsome business block would become the most valuable piece of realty in Iowa, commanding more to the square inch, probably, than any other piece of equal surface area in the state if placed on the market. December 28 of the same year, Iowa was admitted to statehood, and Mr. Clapp has never left the land of his adoption. He endured the privations common to all the earliest settlers, who, it has been said, were “all poor alike”. But as applied to them “poor” only meant lack of wealth. They were rich in moral courage and rugged physique; rich in that western spirit of independence and self reliance; and rich in generous hospitality; resources that no one who ever attended a log-rolling, house raising or husking bee could have failed to notice.